Suitable execution of the transport. Whether you require a chauffeur or a more extensive service for your business relations. VIP International has an agreement with the BMW organisation for the supply of distinguished limousines. We can of course also provide you with a chauffeur for your own executive or company car. Arranging transport in a different type of car is no problem for us either. In addition, VIP International can also provide other means of transport. For this purpose we have excellent contacts with various large and smaller coach companies. If required, a hostess is available to take care of you and your guests. VIP International organises transport by Conference VIP Coach with air conditioning, luxury upholstery in stylish colour combinations, microwave oven, hot-air oven, coffee and tea facilities, toilet, computer, fax, CD, video and telephone connections in various seats. The ambience in a Conference VIP Coach creates a naturally peaceful environment. You and your guests can relax and/or convene during the trip. 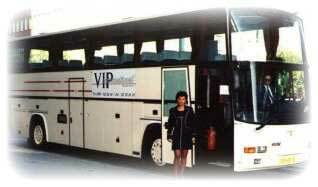 A VIP Coach provides space for 25 to 26 persons. 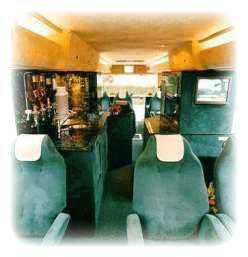 There are various refreshments on board for you to enjoy during the trip. A VIP Coach has enough facilities on board should you wish to make a business report during the trip. You can of course also book Luxury Coaches or Double-deckers through our organisation. Finding the right balance between price and quality of the service you require is what makes VIP International so valuable to you, as a client. Whether it involves your (lease) service car or your personal property, it will make no difference to the personnel of VIP International. The car will be treated with the utmost care. Via our own internal CAR-CARE Service you can have your car collected, washed and cleaned, and returned to you at your convenience, a complete service unlike any other company offers. All these cars are washed and polished by hand to prevent excessive scratches on your car lacquer and to preserve your car. It also limits the depreciation of your vehicle. Regular maintenance goes further than mechanical maintenance at the garage. Please contact our staff for more information on this. • are in possession of one or more First-Aid Certificates. Would you like to welcome your guests in a nostalgic atmosphere? If so, then VIP International can offer you a helping hand in this, too. We act as a liaison between you and the various transport companies and just one telephone call to us is enough to guarantee you an outstanding tailor-made solution for your transport. Friendly hosts and hostesses take care of you and your guests during a business trip. The diversity is too great to list. So don't hesitate to let VIP International inform you about the feasibility of your specific requirements. Antique coaches, British double-deckers, or an old Parisian city bus with balcony, to list every possible option would take up too much space. As a result of regular inspections the equipment used for the trips meets the strict passenger safety standards. For distinguished luxury there are also various (seaworthy) sailing vessels to take your guests on a rural sailing trip on the many waters present in the Netherlands. This enables you to mix with your business relations in a relaxed atmosphere. Obviously, these ships are also available for sea trips. The interior provides your guests with a warm ambience. One is able to wander between various decks. It is the finishing touch to your business dinners or business presentations. Moreover, various hosts and hostesses will be at your service. We are also able to meet your demand for worldwide transport by air. We can have you taken to your destination by a small or large business plane. Another service we will be glad to help you with. Helicopters as a means of transport are no exception when it comes to this. "Qua Patet Orbis", which is Latin for; "As far as the world stretches", which also applies to VIP International, your partner in distinguished business transport!